You're in high school! What's your life like?? I'm really into my extracurriculars. I try to get good grades. I'm one of the popular kids. In my friend's sweet ride. This guy I've grown up with. Time for the weekend! What are your plans? Taking it nice and easy. Some party thrown by the jocks. Your birthday is coming up. How are you celebrating? With a gigantic blowout party. Just doing a small family thing. It's senior year. What's planned in your future? Move to a big city and find myself. Going to stay local and get a job. Going to travel and see where life takes me. 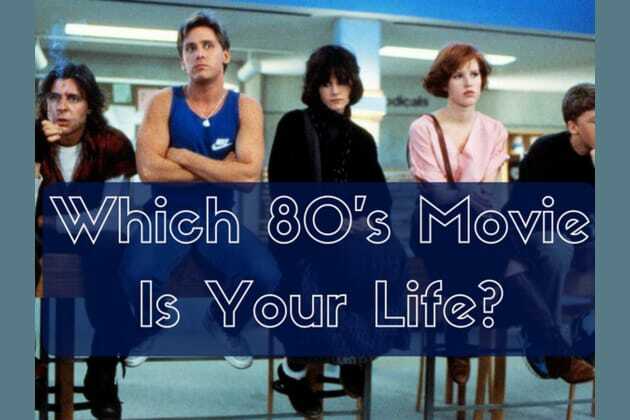 Your life is literally like: Ferris Bueller's Day Off! Just like Ferris Bueller, you're charming. Which means your life itself is pretty charmed! You're able to get away with a lot of things, but just bear this in mind: at some point, you won't be able to get away with *everything*. Think about that. Your life is literally like: Pretty In Pink! Hey there, sweetums. We know life's tough, and you feel like the deck's stacked against you. But if you persevere, and keep going through the muck, you'll get through it and come out on top. Who says you can't have a fairy tale ending? Your life is literally like: Heathers! This just got a little dark. Like Veronica, you get mixed up in places and with people who necessarily aren't the best for you. Work on developing your inner strength so you can stand on your own, for what you believe in. Your life is literally like: The Breakfast Club! The world's a pretty tumultuous place, and you're beginning to realize that everyone's got a different sides to them. Basically, we all contain multitudes, and people will surprise you if you let them. Keep on letting them in and awesome things will happen!